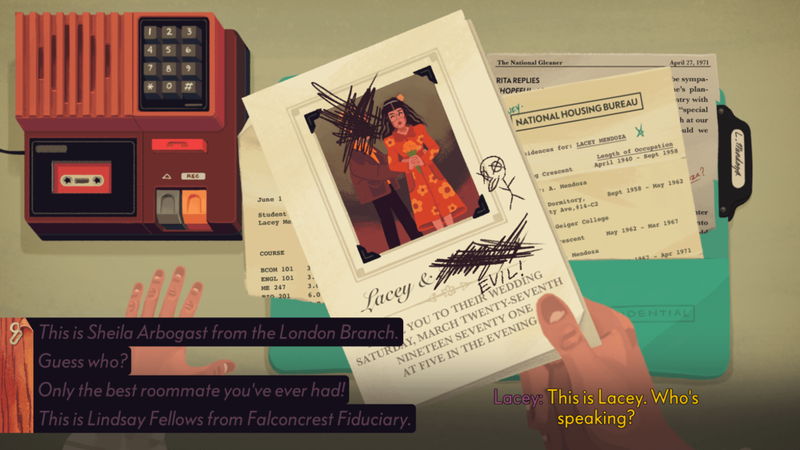 XGen Studio's The Low Road paints a beautiful portrait of industrial espionage in a surreal 1970's pastiche. 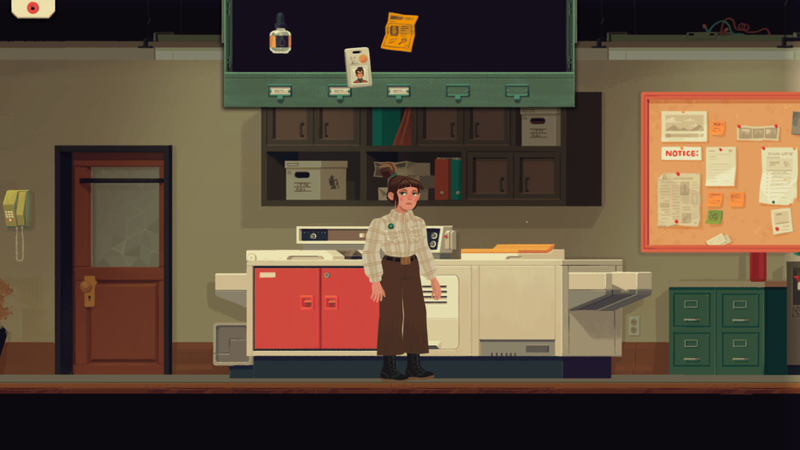 This traditional point and click adventure places us in the shoes of Noomi Kovacs, who is eager to start her career in espionage but soon learns her exciting life starts with, at minimum, a two year stint as a desk jockey on the off chance that maybe, one day, she can live the high life of Outside Intelligence, which isn't all it's cracked up to be either. The game portrays industrial espionage through deadpan humor and wit that is unmistakably fun in execution, thanks to memorable characters with well-delivered voice acting. There are a few bumps in the road, but overall you will find an entertaining experience that any fan of the genre will enjoy. Is it strange to me that I got excited at the very thing that Noomi loathed about her job? When first introduced to her new role, Noomi is tasked with calling a potential lead and faking her way through the conversation to dig up information that would help the agents in the field. As the call prattled on, I was to sift through a manila folder of data in order to lie and cheat my way to the info I needed. The feeling of frantic desparation as I B.S. 'ed my way through the call was what I hoped to find more of through the game, but it turns out that there's no urgency (the other end of the line will patiently wait for you to answer) and that this mechanic is barely returned through as the story progresses. What you do get is a fun, witty puzzler that follows traditional tropes: Noomi needs a person to move so she can get to something, so she sets off a Rube Goldberg list of events to cause that to happen. There isn't a lot of "item combining" as found in other games of the genre, and most everything is pretty straightforward, so you can get back to the excellent acting quickly. As the game progresses, it bounces back and forth between puzzles and the traditional gameplay. Many of the puzzles are well done, but they all appear completely confusing at first, expecting you to figure out the mechanics involved, then solve them. The puzzles (in particular the folders of information/phone call) are stand out and deliver unique and fun moments in the game. I was truly engrossed in the story thanks to the approach. For example, Noomi is bluntly told there's a good fifty people in line to do field work before her, and the current agent isn't leaving any time soon, so her first order of business at her new job is figure out a way to get everyone else fired. The oddball but straightforward approaches Noomi takes to get the job done are a fresh breath of air to a stale spy genre that usually tries to follow beat-for-beat steps. You do a LOT of lying and manipulation to get the job done. Noomi and her cohort Agent Turn dig into the seedy underbelly of their main competitor in the auto industry, Rev Inc, and learn not everything is as it seems. Puzzles are straightforward, with just enough mystery to keep you guessing, but not enough for you to require a hint guide every step of the way. Usually, there are a scant few interaction points, and the right combination of items will push the story forward. Games like this usually have a lot of points of interest, with most of them simply leading to comedic lines, but XGen minimizes this, focusing on quality over quantity, and the game is better for it. No one scene lingers around too long, and the game stays fresh throughout. The beautiful papercraft graphics fit the story's 70's vibe well, right down to the period clothing. The 70's feel is subtle and real instead of oversaturated like a lot of media portrays it. Perhaps my biggest peeve about the game is the lack of interaction for the touchscreen. As a point and click, most of the game could be played via taps on the screen, but the game seems to have been tailored to the Switch gamepad and does not utilize the touchscreen at all. Instead of clicking on an area of the screen for Noomi to walk to, you have to physically angle the analog stick. This can get tedious, as Noomi isn't a fast runner at all, and some puzzles leave you waltzing back and forth across a room multiple times. Puzzles that have big chunky buttons scream "grab me and move me" but you have to stick-control Noomi's hand, grab and move. Even the inventory has a little drop down hanger in the corner as if I'm supposed to click it, but requires a button to interact. This is something I hope XGen considers patching in at some point, as the game is out for Steam as well, meaning there has to be mouse support somewhere (I did not get a chance to review the PC edition to know whether or not or how well that would be implemented). Another thing that I won't allow to hinder my score, more of a word of warning. The game autosaves itself. You have the ability to manual save, but it isn't really at the forefront of your mind. I entered the final act of the game. In each previous area, there was a lengthy song portion (wonderfully catchy tunes by the way), so I took a second to run to another room and run back. I found the game had went on and given dialogue. Not seeing any save icons in process, I quit out to reload the game, since I didn't want to miss any storyline. When I reloaded, the game was at the place I was supposed to be, but there was no player character, unless I was hiding or in disguise. No button did anything except for the inventory, and going in there caused the game to hard crash and boot back to the menu. Whether this is a glitch or the result of a foiled save I don't know, but I was sad to see that this was now my entire save, all my work up to that point was lost. I really want to see how the story pans out but don't have the time to replay those hours right now. I'm hoping that the game gets follow up patchwork that may revive my save file, or at the least offer retroactive chapter select, so I can go back a bit and work my way back up. I'd suggest manually saving a secondary file when you get through chapters just in case. I researched and found no other reviewers with any concerns about their save files, so either I found a hard to replicate glitch or the game was saving smack in the middle of a cutscene and I didn't see the icon, but I'm really confused as to why that wouldn't corrupt the entire save file. Just take care. Overall, though, I have absolutely loved my time with The Low Road. Noomi and Turn are wonderful protagonists with more depth than you expect in this genre, and the tale is fun to follow. The environment is perfect, with wonderful voice acting and a catchy soundtrack I'd buy on it's own. I'd like a bit more choice and variety in my control scheme options, and wish I hadn't found that one bug, but I think that I'll end up sharing this wonderfully humorous world with someone else in my life to see it through to the end. In the land of industrial espionage, it may make sense to try to take the high road and fight for the greater good, but Noomi and Turn take the Low Road. It's a fun ride that's worth every twist and turn. Special thanks to XGen Studios for providing a copy of the Switch release for review!